Shot in Iceland by Brazilian filmmaker Joe Penna, this stripped-back survival thriller makes the audience shiver as we feel trapped in a snowy wasteland with the central character. It's also remarkable as a one-man odyssey, with Mads Mikkelsen delivering a performance rippling with both emotions and physicality. There's not much more to it, but it's a memorable cinematic experience. 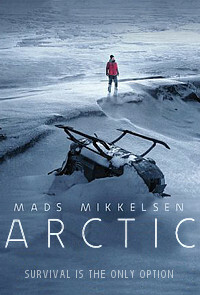 Overgard (Mikkelsen) is the only survivor of a plane crash in an icy, mountainous wilderness. He lives on fish caught beneath the ice and keeps an eye on a hungry polar bear as he sends signals to possible search parties. Eventually a helicopter appears, but it's caught in a storm and crashes, leaving one badly injured pilot (Smaradottir). As Overgard continues trying to survive against the odds he realises he needs to be more proactive, so he takes his wounded companion on a treacherous journey through the mountains in the faint hope of finding help. Aside from a few hints here and there, there's no back-story to either of these characters. We have no information about how Overgard's plane crashed, who he is or even where he's from. Instead, Penna just throws the audience into the vast expanse of snowy wilderness along with him, encouraging us to think along with Overgard and understand a series of seriously harrowing decisions he is forced to make. The setting is so authentic that it can't help but make us feel cold; this was clearly not shot on a soundstage with bluescreen. It also helps that Mikkelsen plays the role with remarkable subtlety, letting the viewer in on his thought processes without ever making things obvious. This gives his emotions almost overpoweringly authentic kick, including his connection to this young woman he is unable to communicate with (she is part of a Thai rescue team). Smaradottir has little to do but lie there grimacing in pain, so her efforts to survive are much more internalised, but she manages to evoke her own sense of steely desperation. Through all of this, both Penna and Mikkelsen hold their nerve, refusing to give into the various big dramatic angles offered by the premise. This isn't a character study like Tom Hanks' Cast Away, it's a gritty, almost doc-style depiction of nervy resolve and methodical skill. There is the nagging click of a plot structure as various things happen, so it's difficult to ever feel like we're watching anything but a movie, even if nothing goes as expected. But it's properly gruelling, packed with both grim authenticity and a haunting sense of hope. Christophe Honore channels elements of his own life into this sensitive, honest romantic drama. Set 25 years ago, the script blurs proscribed definitions of sexuality in ways that feel bracingly present-day. The original title translates as "like, love and run fast", drawing on an emotional undercurrent of impending mortality. It's a beautiful depiction of the yearning desire to share life and love. In 1993 Paris, 30-something writer Jacques (Deladonchamps) lives with his young son Louis (Farge), relying on help from his upstairs neighbour Mathieu (Podalydes). On a working visit to Rennes, he meets 22-year-old student Arthur (Lacoste), and the spark between them is instant. Back in Paris, Jacques is trying to help his ex Marco (Gonzalez), who is dying of Aids while Jacques is yet to have symptoms. But he can't get Arthur out of his mind. They write and chat on the phone, although Jacques thinks that he can't handle a "final" love. Honore infuses vivid realism with heightened dramatic touches. After an evening with his girlfriend (Wismes), Arthur goes cruising, wordlessly navigating a secret gay culture. Jacques and Pierre's first attempt to get together is a series of wonderfully absurd obstacles. And the ongoing problems these two men have as they try to come together is meaningfully echoed in a series of strikingly authentic situations, with distractions and personal issues in the mix, as well as the comfort of random strangers. Performances are earthy and natural, even in moments when Honore indulges in evocative imaginative touches. Interaction is complex and often realistically awkward or interrupted, which allows the cast to add clever angles to the characters. Both Lacoste and Deladonchamps are likeable and prickly at the same time, making decisions that some people condemn, but always trying to do their best. It's refreshing and telling to see scenes portrayed with this level of nuance, both in the acting and the filmmaking. Each scene is set out in a way that forces the audience to think, reconsidering the characters and their connections as well as the way movies usually portray these kinds of things. These men aren't necessarily gay or straight, they love who they love. Honore never forces a plot point, letting the events unfold with a rare narrative integrity. He also includes tiny details that tellingly ground each moment. So even when the narrative seems to be circling aimlessly or turning inexorably bleak, it's clear that this is coming from a personal passion. Icelandic filmmaker Benedikt Erlingsson takes a playful approach to a story that contains layers of darker meaning. It's an unusually gripping narrative with an offbeat antihero. And her personal journey is deeply moving, even as the film knowingly touches on both massive political issues and some darkly comical attitudes. In other words, it's a rare movie that's entertaining and has something important to say. Around Reykjavik, Halla (Geirhardsdottir) is waging war on global corporations that have arrived to bleed her nation's resources dry. Sabotaging an aluminium plant, she escapes with the help of a stranger, Sveinbjorn (Sigurdarson), who's probably a cousin. But the government's security forces are hot on her trail, which is dangerous for her friend on the inside, Baldvin (Ragnarsson), a civil servant who sings in Halla's choir. Then Halla gets a shock when she hears from the adoption agency she applied to four years ago: they have a Ukrainian war orphan who needs a mother. Erlingsson fills the screen with clever touches. The witty camerawork continually catches background musicians within scenes, sometimes interacting with characters. Side roles include a Latino tourist (Estrada) repeatedly scapegoated by police for Halla's sabotage. And Halla has a twin sister Asa (also Geirhardsdottir) who plans move to an isolated Indian ashram for a few years. These seemingly random elements feed into the script's sharp exploration of the ironic clash between multi-cultural society and multi-national corporations. 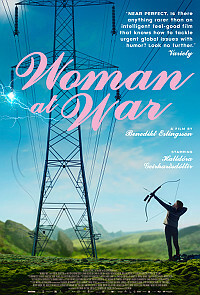 At the centre, Geirhardsdottir delivers a full-on performance that grabs hold from the opening shot of her firing an arrow to short-circuit an industrial power line. Charging across mountaintops is contrasted with her work as a choir director and a more internalised exploration of a woman in her late-40s finally realising her dream to become a parent. She also beautifully plays the interaction between Halla and Asa, who are intriguingly contrasted as flip sides of the same coin. The ideas swirling around this story are so important that they sometimes threaten to overwhelm the quietly involving drama. Thankfully, Erlingsson keeps the themes in the background, letting them gurgle meaningfully through everything that happens, rather than shouting anything too loudly. Certainly, Halla is fiercely dedicated to her cause, worried that big companies are threatening humanity's future. And in the film's final scenes these ideas take on a much more intensely personal slant that leaves the audience with plenty to chew on.